23 cm long (9 inches). 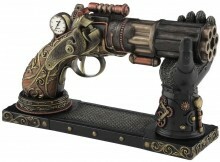 Solid Cold cast bronze figurine steampunk pistol with the revolver 6 barrel supported by a steampunk gauntlet. This display piece has a moving trigger meaning you can happily pretend to fire it. The gun can be taken off the stand. Excellent use of colour and detail including the pressure gauge. Excellent quality. Both stand and gun feel weighty and solid. So even though it's not a real gun you can still use it to beat intruders down.